Waltzingmouse Saturday Sketch - Get Well Soon with the Balm of Friendship! It's Saturday and time, once again, for the Waltzingmouse Sketch Challenge!! This week, Mischief Maker, Kelly designed our fun sketch! Isn't this cool?!! I used Teeny Trees to create my little framed scene - I used the oval shaped tree to make my rolling hills! I stamped the background panel with the negative dots and one of the gingham stamps from Gingham + Co. The circles along the bottom are from Rescue Remedies. Here's the tag removed from the envelope - The label and circles are from Rescue Remedies and the little bird and leaf are from Teeny Trees. 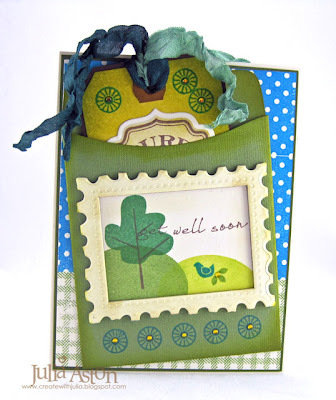 I'm thinking this would be used as a bookmark by the receiver of this get well card - and a book would be the perfect gift to go along with this card! I hope you'll join us in making a card for the WMS sketch challenge this week! You can check out all the details over at the Waltzingmouse Sketch Challenge Blog. 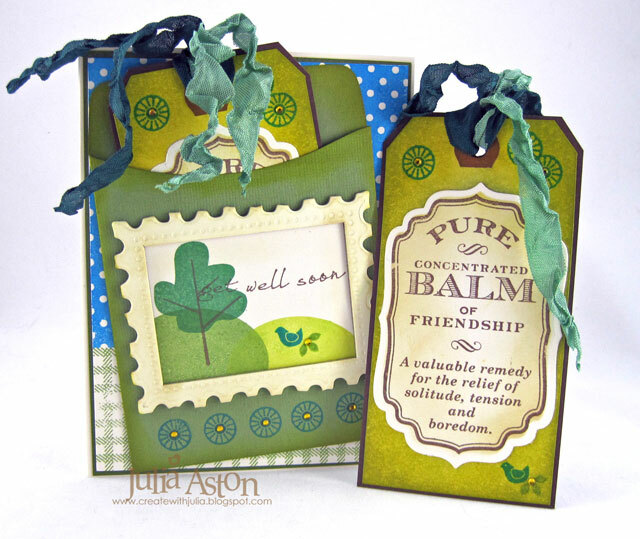 Please stop by again on Monday - the WMS Design Team will be having the August SOAP - Stamp of Approval Parade - that will run August 1 - August 4 - where we will all be inspiring you with projects created using the WMS July release stamps! 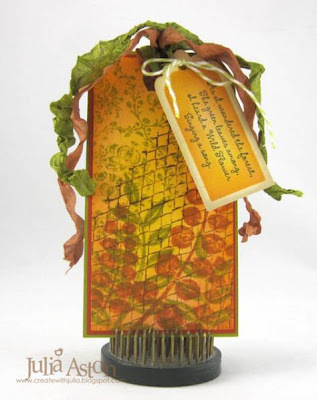 Stamps: Waltzingmouse - Teeny Trees, Rescue Remedies, Gingham & Co. Ink: Memento - Rich Cocoa, Bamboo Leaves, Cottage Ivy, Pear Tart, Bahama Blue; Ranger Distress - Antique Linen, Crushed Olive. Accessories: Chipboard frame - Tattered Angels, wrinkled seam tape - Prairie Bird Boutique Etsy Shop, tiny twinkles - Taylored Expressions, glue pen, green library pocket - Bazzill Basic Papers, Labels 4 Nestability, cropadile, shipping tag - Staples. Hi Stampers! I'm on vacation this week - but at home - so I have extra time to stamp but I'm also out enjoying my time off - shopping, visiting, gardening etc! Kent and I were up in NH visiting friends for two days early this week - the weather was overcast with intermittent rain so we didn't get to go swimming and enjoy outdoors - but we still had a lovely time visiting. I used this week's Split Coast Sketch for my cute little birthday card today. This sweet bear is a Sweet 'n Sassy Digital image called Rhubarb's Birthday, the sentiment is from Oh Happy Day - a free set with a minimum order in July. 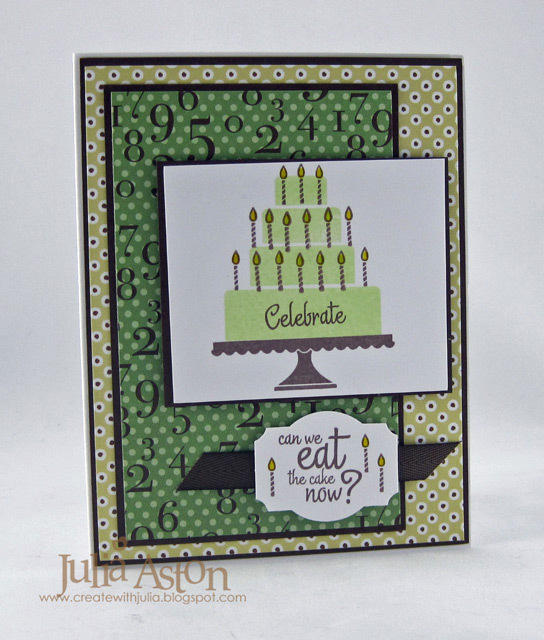 The fun party papers are from the Basic Grey paperpad called Cupcake. Korin has been drawing Rhubarb's for every season and holiday and each one is sweeter than the next! I double bowed a multicolor piece of wrinkled seam tape around the bottom and added tiny twinkles on the candle flame, the hat and the sentiment for a little shimmer! Hope to see you back here on Saturday when I'll have my Waltzingmouse Saturday Sketch card up! Saturday Waltzingmouse Sketch - A Basket of Balloons! It's an especially nice Saturday for me - first - I've started a two week vacation - whoo hoo! and second - it's time for the WMS Sketch Challenge! I was the designer of the sketch again this week - I hope you find it inspiring! I took a few liberties with my own sketch (!) using sentiments in the center instead of rectangles. My original plan (in my head) was to have 4 baskets along the bottom - but they didn't fit - so this design evolved! My card is 3" x 5 1/2" so it will fit in a regular A2 envelope. And see my balloons?? they are actually eggs from the Spring Baskets set that I stamped upside down! The string knots are from Bitty Banners - I drew the long strings with a fine marker - the basket and Birthday Wishes are from Bountiful Basket Additions, the Bravo! and Hurrah! are from Fancy Phrases. I left everything clean and simple - no coloring, bling or ribbon so this could be sent to a guy or a gal! 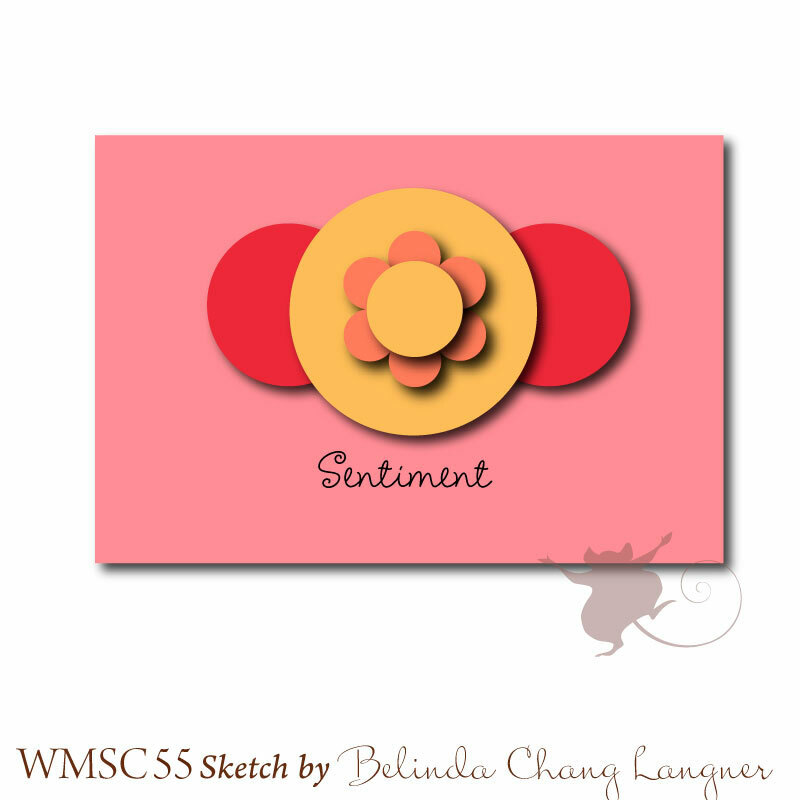 I hope you will join us by making a card using my sketch this week - you can check it all out at the WMS Sketch Challenge Blog. You could be chosen a top mouse or win a WMS stamp set! Winners are announced on Saturday's along with the new sketch for the week. Stamps: Waltzingmouse - Fancy Phrases, Spring Baskets, Bitty Banners, Bountiful Basket Additions. Paper: White - PTI, 2 shades of orange Bazzill. Ink: Memento Potters Clay & Rich Cocoa. Accessories: large oval punch - SU, foam tape, brown Micron 01 pen. The Queen and A Bee-Bear Birthday! Some fun news to share today - I was chosen Queen for the Day over at Split Coast!!! Which means that those who wish to play along choose a card from my SCS gallery to CASE. It's so fun to see what cards people create based on cards you have made! I am very honored to have been chosen. I made this fun little birthday card based on the SCS sketch this week- just a few rectangular shapes - not a lot of clutter - right up my alley! I rummaged through my patterned papers and found these two bee themed sheets - the thin strip is a honeycomb pattern (can you see it?) and the larger panel is a bee pattern. I used the orange dew drops because I thought it looked like drops of honey! isn't he just the most adorable bear?? Korin has designed lots of digital images of him for all the seasons of the year! Hope to see you again tomorrow when I'll have my card for the Saturday Waltzingmouse Sketch Challenge! It's supposed to go up to 100 degrees here in Boston today - I'm glad I'm at work with the central air!! Stay cool today my dear friends!! Hey stamper friends! I have two cards to share with you today. I used a stamp set I recently purchased from Papertrey Ink called It's a Jungle Out There on both. 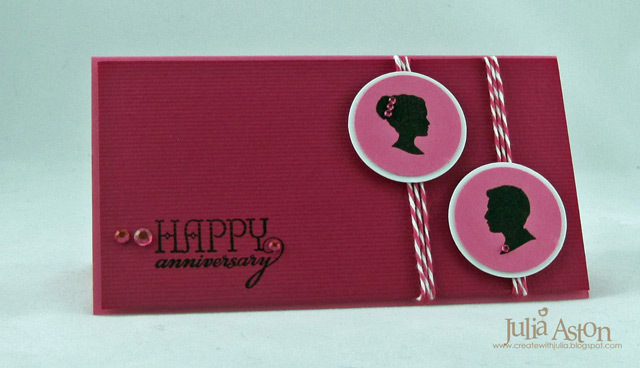 I made my first card for the Queen for the Day Challenge over at Split Coast. I just had to play as my stamping buddy Karen was the Queen! I chose to CASE her cute Zebra's Have Stripes card. This giraffe is a fun two step stamp from Papertrey Ink that I just got - I LOVE how it stamps. 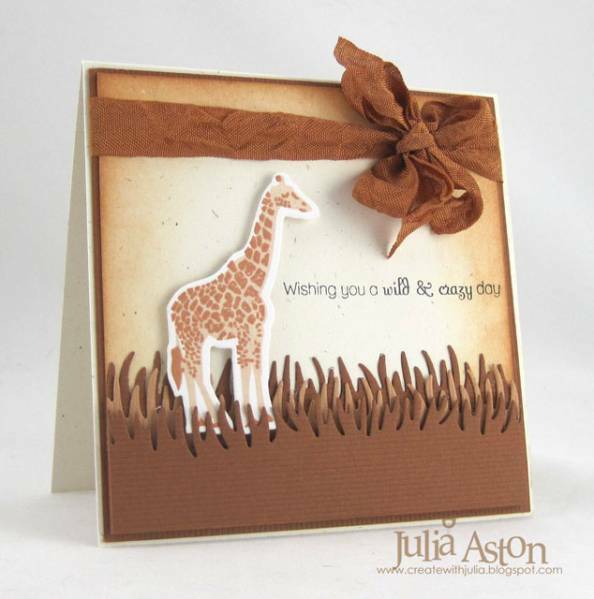 First you die cut the shape, then you stamp the solid background giraffe - then you stamp the spots with a darker color! I also bought the animal dies that go with the set so its easy to cut, stamp and use these very fun realistic looking animals! My second card was made for today's color challenge over at Split Coast - Mary, our hostess this week, has asked us to use Pool Party, Wild Wasabi and Chocolate Chip. 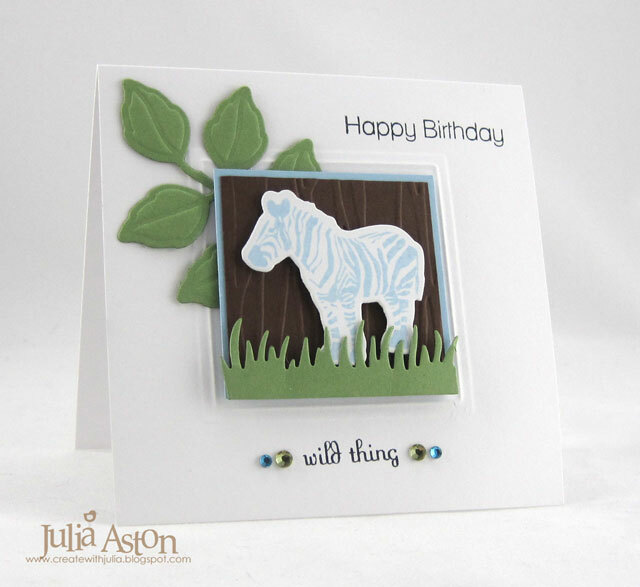 I used the sweet little zebra from the stamp set for this card - just stamping the stripes this time (not the solid background) since I wanted the background to be white! 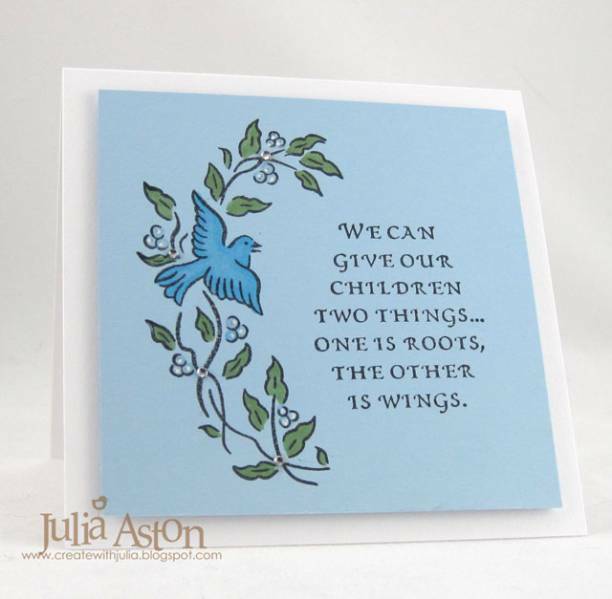 All the sentiments are from the same animal set. The leaf is from the Foliage set by Spellbinders and the die for the grass is from MFT! 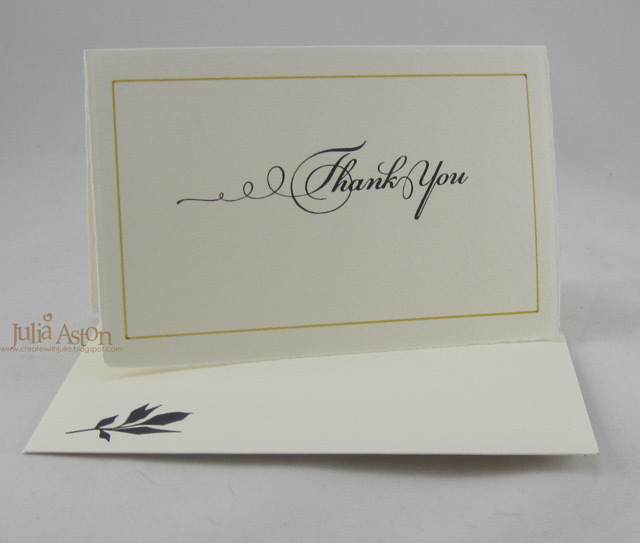 I embossed a Nestability square on my card than adhered the leaf over it. I embossed the brown panel with Forest Branches and layered the stamped zebra that I cut with zebra die onto the panel with foam tape. I die cut the grass and adhered that with foam tape as well. 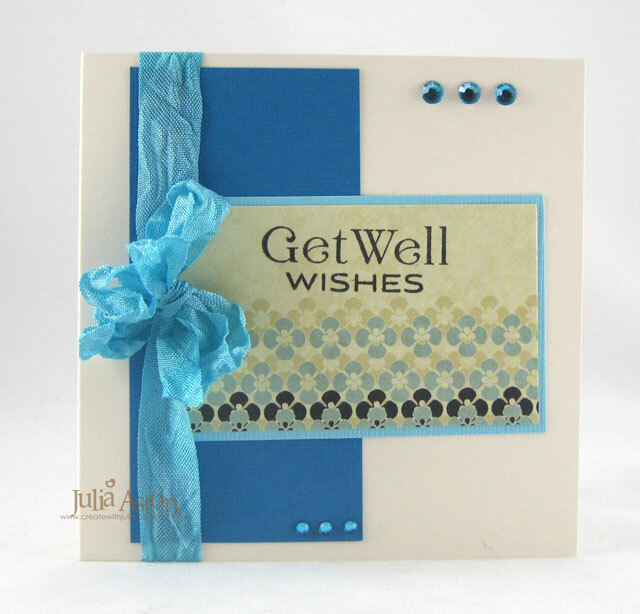 Finally I stamped the sentiments right on the card and added a little bling accent. My dessert option (which could be whatever we wanted this week) - was to use dies on my card! I used 4 of them!! So be careful dear stampers - It's a Jungle Out There!!! Stamps: Papertrey Ink - It's A Jungle out there. Today I'm participating in the Friends of Waltzingmouse Blog Waltz taking place in the WMS forum. The theme this month is birthdays! Check it out here in the Playroom of the Forum. 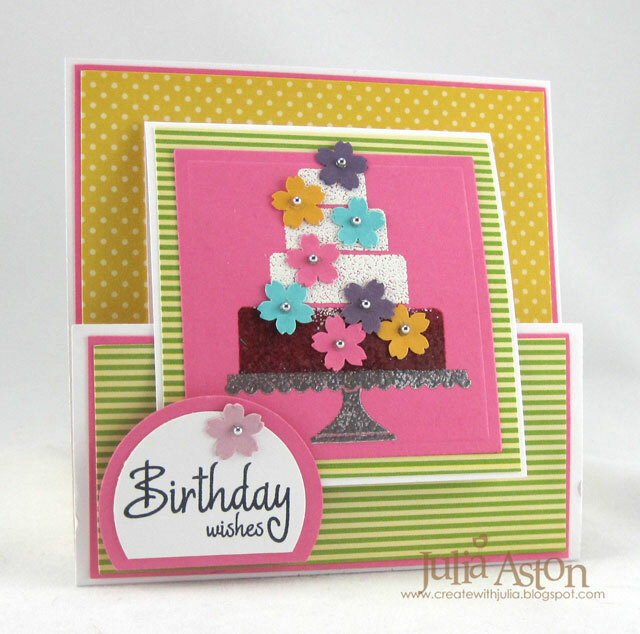 My card was inspired by this cake from the Split Coast Inspiration Challenge yesterday which was the web site Maggie Austin Cake. 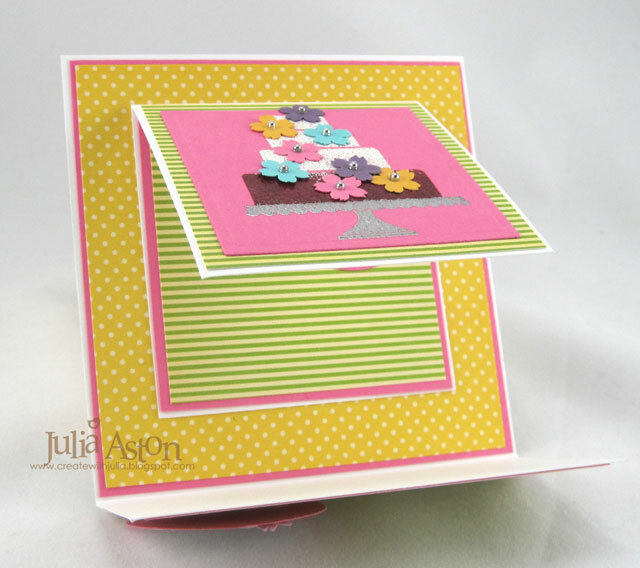 The fold of the card was inspired by Saturday's Crazy 4 Challenges challenge to use the Joy Fold for your card. I stamped the top 3/4s of the cake with Versamark and the bottom piece with dark cocoa ink - then I put white embossing powder on the top pieces and clear embossing powder on the chocolate piece and embossed the cake with my hot gun. Finally, I stamped the cake plate with Versamark and embossed it with silver embossing powder. The cake panel is tucked under the sentiment circle on my card. When you slip the cake panel out, it opens up to show the inside of the card. I cut off the bottoms of the circles for the sentiment piece so it was easier to slip the top piece behind it. You'll find the Joy Fold Tutorial on Split Coast Stampers in the forums here. 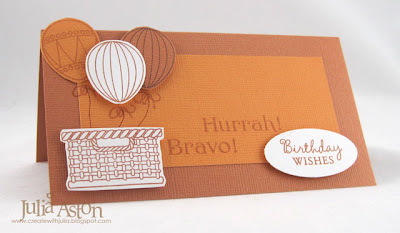 Now I'm off to the WMS forum to blog waltz and see all the fun birthday card inspiration! Are you coming? Hi guys! I'm SO excited today - I designed the Waltzingmouse Sketch for this week!!! whoo hoo!! 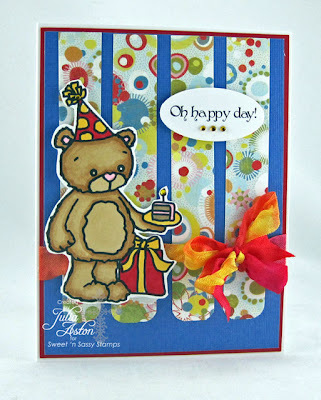 Today my card is all about the papers and colors - using just one simple sentiment stamp from Fancy Phrases. 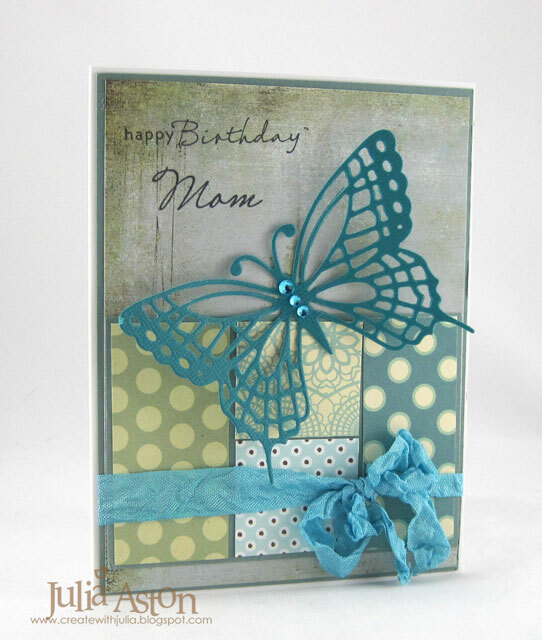 My card was even simpler than this at first - I decided to add the ribbon at the last minute - it looked pretty without it - but it does add some nice dimension to the card and also gives a good balance to the rhinestones in the top right corner. I hope you'll join in on the WMS Sketch challenge this week - and I hope you are inspired by my sketch!!! 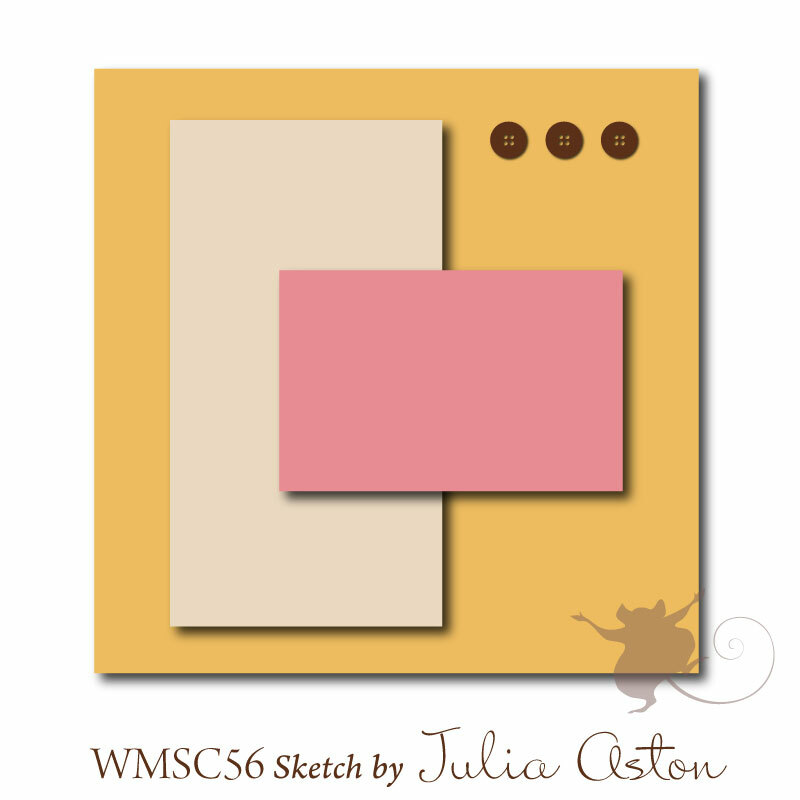 Check out the WMS Sketch challenge Blog for all the details - every week there's a Waltzingmouse stamp set up for grabs! Paper: Vintage Cream - PTI, dark and light blue - Coredinations, DP Websters Pages - Petite Papers/collection triple pack. Accessories: Rhinestones - Kaiser Kraft, wrinkled seam tape - Prairie Bird Boutique etsy Shop. I made this fun little card for two challenges over on Split Coast this week The Tuesday Teapot challenge was to use daisies on your card. And I used this week's sketch. 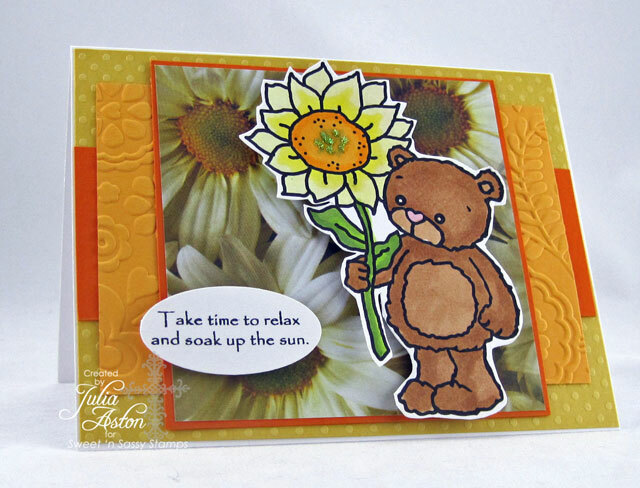 This sweet little flower holding bear is Rhubarb a new digital image from Sweet 'n Sassy Stamps this Sunflower Rhubarb is being released on 7/17 but there are other versions of him available right now! The sentiment is from the Ocean Paradise set. 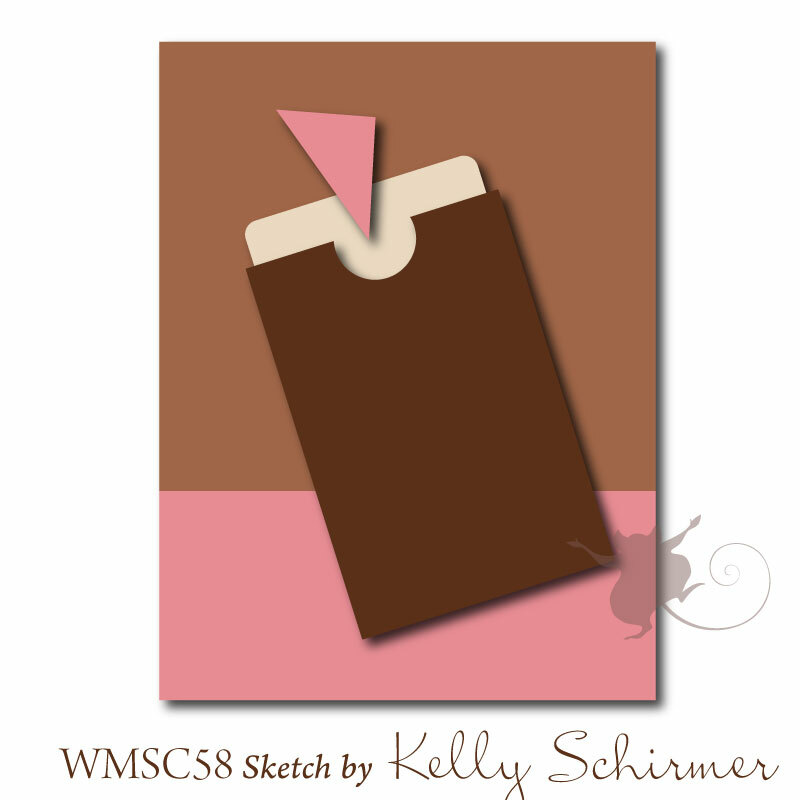 Hope to see you tomorrow when I'll have a card for the WMS Saturday Sketch challenge - I created the sketch this week!! Accessories: Copics: RV11, E34, E35, Y00, Y02, YG03, YG63, Y38, G21, Floral fantasy embossing folder, Eucalyptus Stickles. 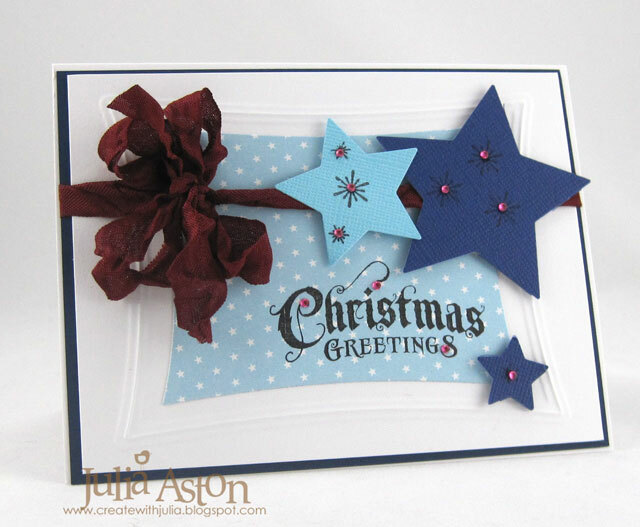 I made this stary Christmas card for this week's color challenge on Split Coast. Karen was the hostess and she gave us Not Quite Navy, Baja Breeze and Cherry Cobbler for our colors. A great color combo don't you think??!! Her dessert option - to make it Christmas or winter. 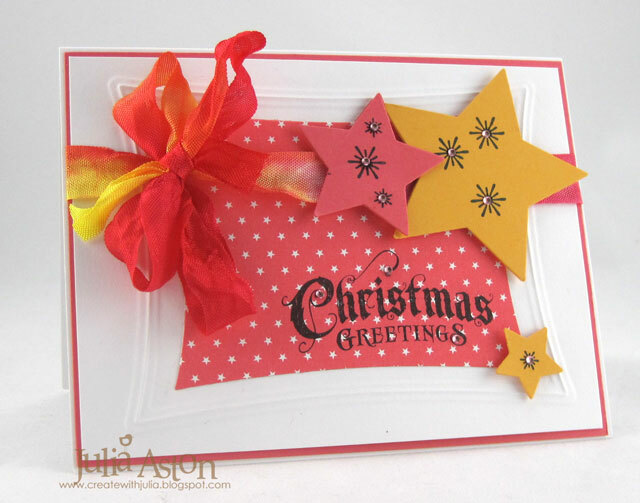 I also wanted to get my cards made for the Waltzingmouse Forum Christmas challenge for July - This month we were challenged to use stars on our cards. So I combined the two challenges! I make at least 3 Christmas cards for each WMS forum challenge - so I'll have 36 cards by Christmas! Here are two more of the same design just using different colors! I embossed a wonky rectangle on the white panels then cut a smaller wonky rectangle in star patterned paper to place inside the embossed frame. My stars are cut with Nestabilities and adhered wth foam tape. 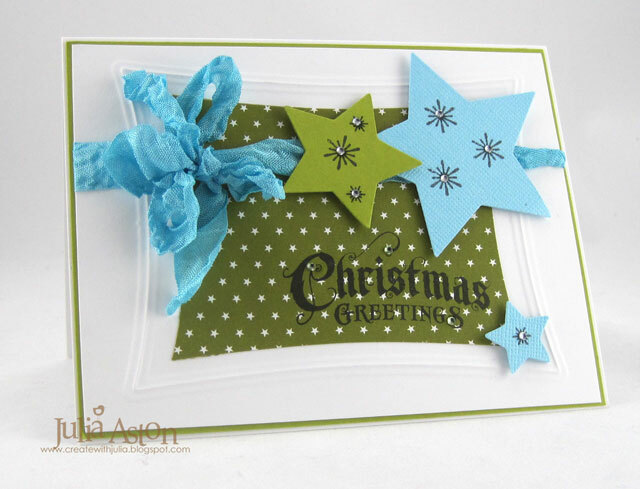 I stamped starbursts on the stars and added tiny twinkles to the centers as well as some on the sentiment. My stamps are from Compliments of the Season by Waltzingmouse. Have you checked out the WMS Christmas Challenge in the Forum yet??? You can also read the details about it on Claire's blog here. Happy Monday everyone - It was SO HARD getting back to work today. We had just absolutley gorgeous summer weather in Massachusetts this past weekend - I spent a lot of time in my garden weeding and mulching and enjoying the sun and soft breezes! I was asked by a co-worker last week to make two personalized birthday cards - one for her sister and one for her mother. I made both cards based on challenges over on Split Coast this past weekend. When I asked my co-worker what her sister's interests were - she said that she loves clothes shopping - a fashionista! The Inspiration Challenge was to look at the website - Posh Vintage - a lovely shop for clothes and a perfect site to give me ideas for the sister card! I was inspired by this pretty floral dress. I used the dress form die from PTI that I cut in white. 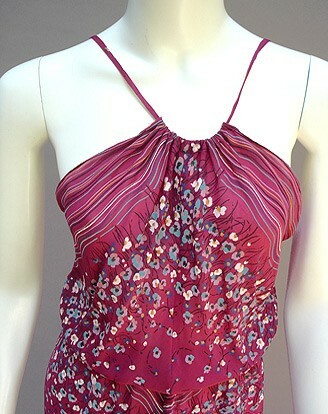 Then I cut it again on this pretty origami floral paper and trimmed just the dress part adhering it over the dress form. The sentiment stamps are from Women of Life by Papertrey Ink and the background text is from Waltzingmouse Text It set. I added layered circle Nestabilities, a bow of wrinkled seam tape and some bling! Here's what I stamped on the inside of this card - the stamps are from Signature Series Dress Form by PTI and coordinate with the dress form die. I chose to case Patter's Hi card to create the card for my co-worker's mother who likes the outdoors. I used different colors and a die cut butterfly but kept her pretty sketch and basic design! The happy Birthday is from Frame It and Mom is from Roses in Bloom - both Waltzingmouse. WMS Saturday Sketch Challenge - Welcome Baby with a Flourish! Today I've got a card for the Waltzingmouse Saturday Sketch Challenge. DT member Belinda was the designer of this great little sketch. For my center circle I used a stamp from an older WMS set called Vintage Circles Small. The sentiments are from Say It Loud (an absolutely WONDERFUL and versatile sentiment set! 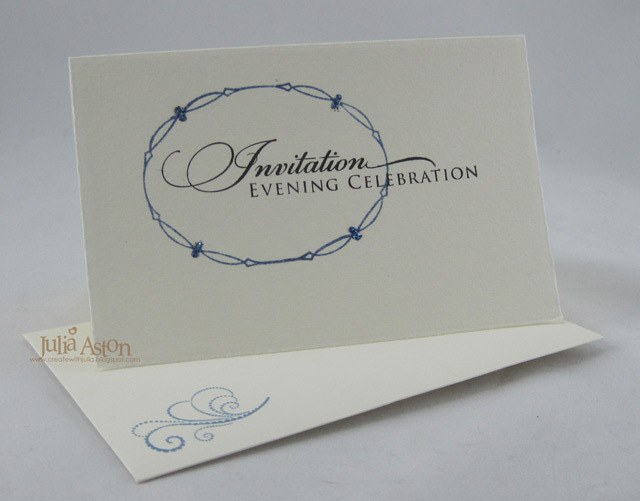 )﻿ and the flourishes are from the newly released Flourishes - Scallops and Dots set. Something I just discovered when I pulled out the flourish stamps for this card - Claire has included a 'right and left' or 'mirror image' of each flourish (accept for the largest one) - so, for example, when I wanted the same flourish on each side of my circle as on my card above - I had it! I was thinking I would have to use a similar but not matching one and that's when I discovered this fact! (duh!) When I used this set in the sneak peeks - I only used the largest flourish so I didn't notice this then! Our Claire is always thinkin'!! So - go check out the WMS Sketch Challenge blog for all the deets and to see the wonderful samples created by the Mischief Makers as well as a few of the DT. 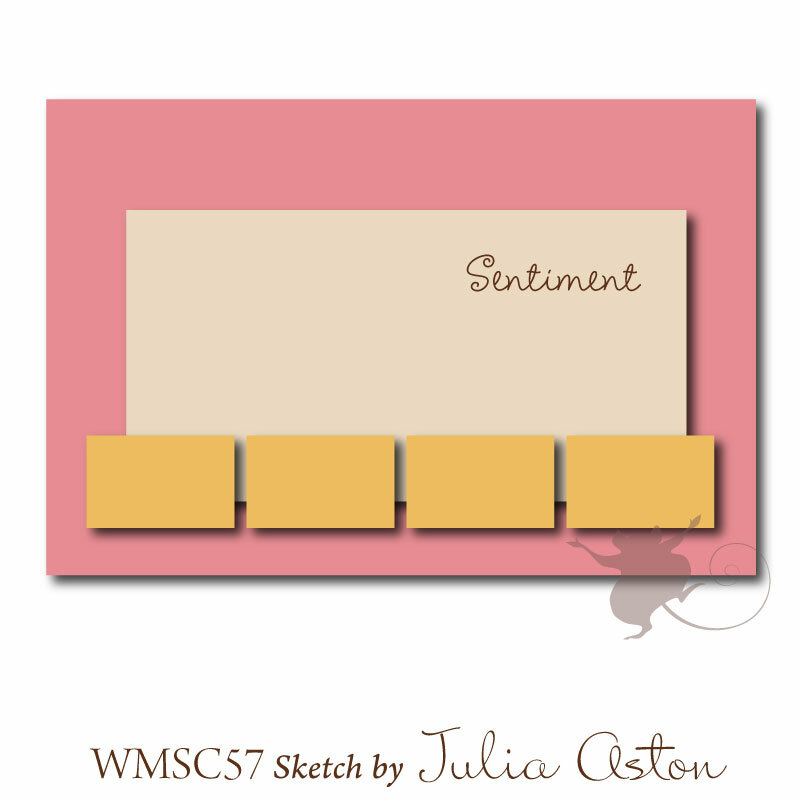 You could win a free WMS stamp set by linking your creation over there! Winners are announced each Saturday along with the new sketch challenge. 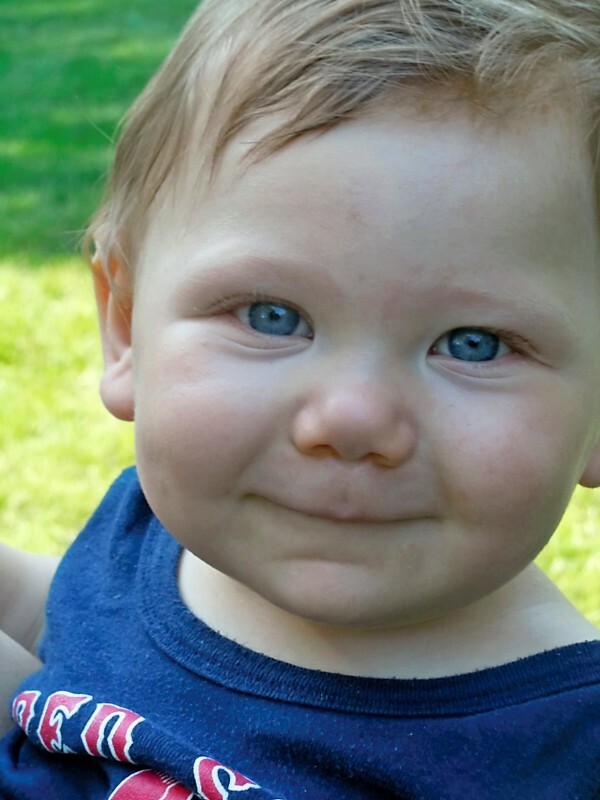 I'm off to visit my 'oh so adorable' 9 month old grandnephew Landon - my sister (his grandmother) is babysitting today and we're going to sit and adore him together!! LOL!!! 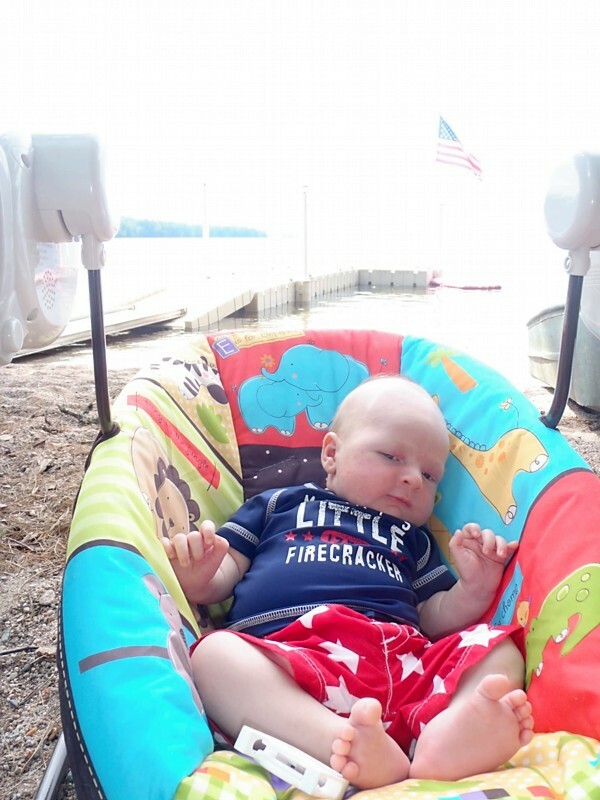 And I might get to visit my other 1 month old grandnephew, James (Landon's new cousin) this weekend too! and here's James - all decked out for the 4th of July! on his first trip to the family cottage in Maine. Life is grand with new babies around! 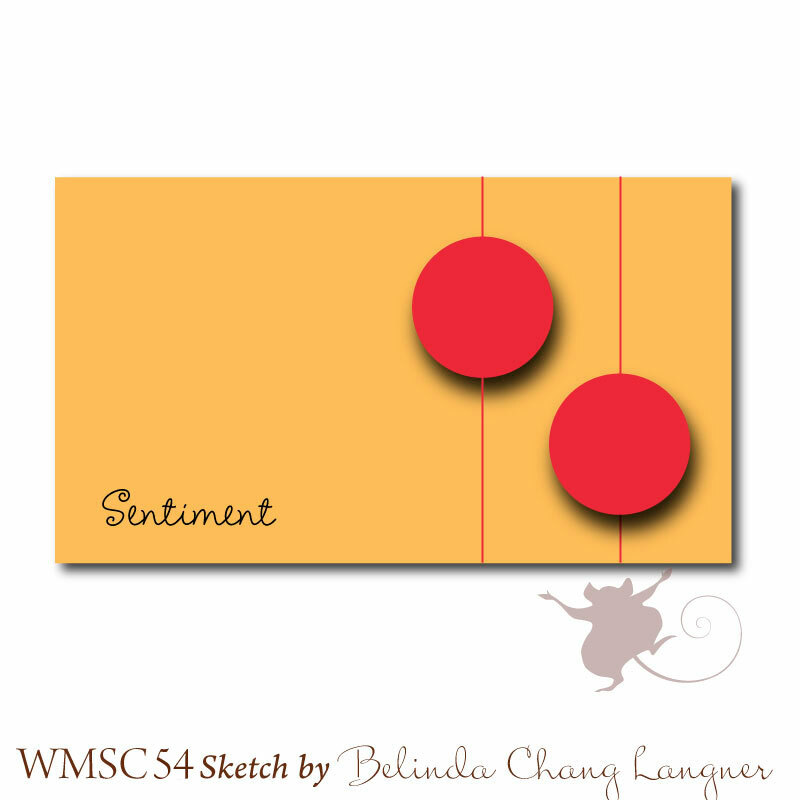 Stamps: Waltzingmouse - Flourishes - Scallops and Dots, Vintage Circles Small, Say It Loud. 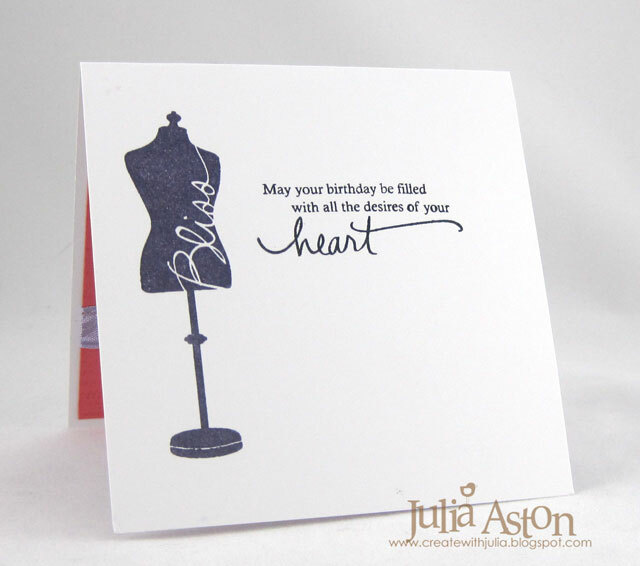 A Silhouette Birthday for a Guy or a Girl! A quick post from me today - I've come to realize that I can't stay up every night until 11 pm and then get up for work at 5:30 am and not be tired!! So I'm hitting the sheets as soon as I post this. I think I'll read for an hour then shut off the light! All in moderation right?! 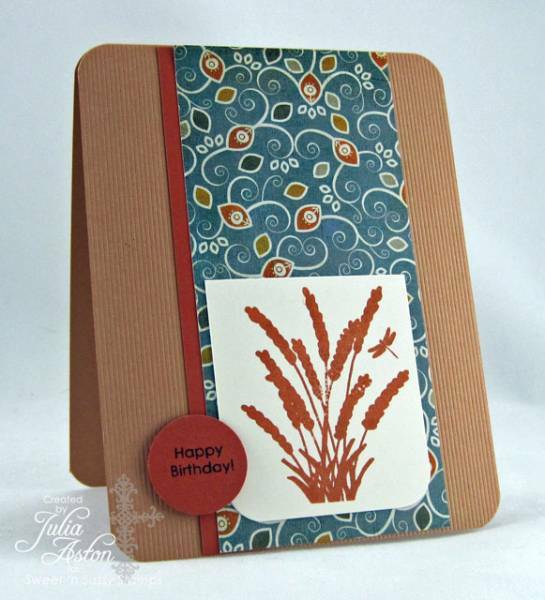 I made this card for the Sketch Challenge over on Split Coast. What a great CAS sketch! My stamps are from Sweet 'n Sassy - the dragonfly and stems are from Serene Silhouette and the sentiment is from the July Release set Seeing Spots. I chose the stamps I wanted to use first - then the ink color - then went in search of some patterned paper that would work with it. I think these colors would work for either masculine or feminine don't you? The card base is a piece of Washboard Bazzill Basics and it has textured vertical lines that gives a nice subtle dimension to the card. Ok - I'm off to get into my book - I'm presently reading " The Divine Secrets of the Ya-Ya Sisterhood" by Rebecca Wells - I never saw the movie when it came out but wanted too (probably too busy stamping!) - the book is really good so far so I may look for it on Pay Per View on cable after I finish it!! Ok, so I know it's not Christmas and it's not even still June !! Well - let me explain ...... I'm partipating in the Waltzingmouse Forum Christmas Card Challenge where every month Lynn gives us a new challenge to use for that month's Christmas cards. The June Challenge was to use a big ribbon and I think I kept putting off making a card because I like to make my Christmas cards as thin as possible so they don't cost extra postage and I knew a big ribbon would be THICK! But when it suddenly got to be July I realized I better get one made before the July challenge got posted!! When I thought big ribbon I imediately thought big ornament! So I got out the Vintage Ornament set and thought this background from Pic-Nic Patterns would look good behind it. The sentiment is from Compliments of the Season. The ornament is popped up on foam tape and the ribbon is adhered with a glue dot. I always like to make at least 3 cards when I do the Christmas challenge so hopefully I'll have enough to send out when December rolls around - so I made three this month just changing the sentiment on the ornament. And you know - this silk ribbon is pretty light so I bet if I do mail them it may not even be more postage! So much for worrying so long about it!!! July 10th is when Lynn posts the challenge for this month - you should check it out and come join us! You'll thank me in December!! 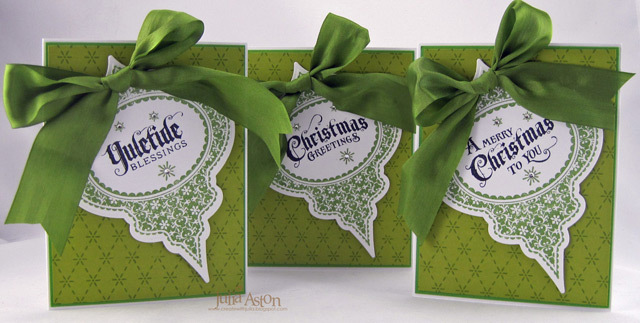 Stamps: Waltzingmouse - Vintage Ornaments, Compliments of the Season, Pic-Nic Patterns. Accessories: foam tape, clear rhinestones - Michaels, glue dots, satin ribbon - May Arts. Waltzingmouse Saturday Sketch - A Cameo Anniversary! Welcome to Saturday and another fun WMS sketch! Belinda did the honors of creating another fun one for us! And since I had all the new July Release stamps still out on my worktable - I naturally grabbed the lovely Cameo Sets for my card! Pretty clean and simple on this - just like the sketch. I just added a little bling and twine! My top panel is a lovely textured Bazill. The card base and silhouettes are Hibiscus Burst. I popped the panel and circles up on foam tape. We hope you'll be inspired and join us in the sketch challenge this week - you will find all the details on the WMS Sketch blog. Can't wait to see what you create!! Every week one lucky entry wins a free WMS stamp set so get to it!! Hope all those living in the US have a wonderful and safe 4th of July Weekend and Happy Canada Day (yesterday) to all those living to the north of US! Stamps: Waltzingmouse - Sentiment from Cameo to Go, man and woman cameos from Cameo Creations. Accessories: Pink Sorbet twine - The Twinery purchased at Sweet 'n Sassy Stamps, Tiny Twinkles - Taylored Expressions, Rhinestones - Kaiser, foam tape. WMS DT Blog Waltz - July Release Day! Well we finally made it! 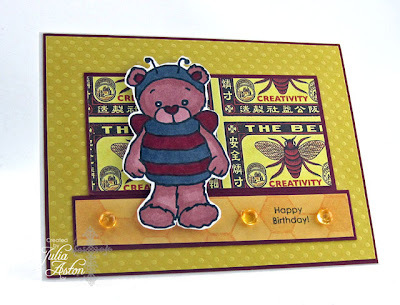 Welcome to the Waltzingmouse July 1 Release Design Team Blog Waltz!!! If you came here from Kate's blog you are in the right place. Today I'm sharing some clean and simple note cards and a birthday cake card using a few of the new sets (see my supply list at the end of this post). Remember to stop by Claire's Shop to get your order in for your favorite Waltzingmouse July sets before they're gone! I hope you have been inspired by all our creations the last few days. Be sure you leave comments on each of the design team members’ blogs. There will be a prize of a stamp set of choice from a random drawing from one of our blogs. You have until Saturday, July 2nd, at 11:59 pm EST, 10:59 pm Central, and 8:59 pm PST to enter. 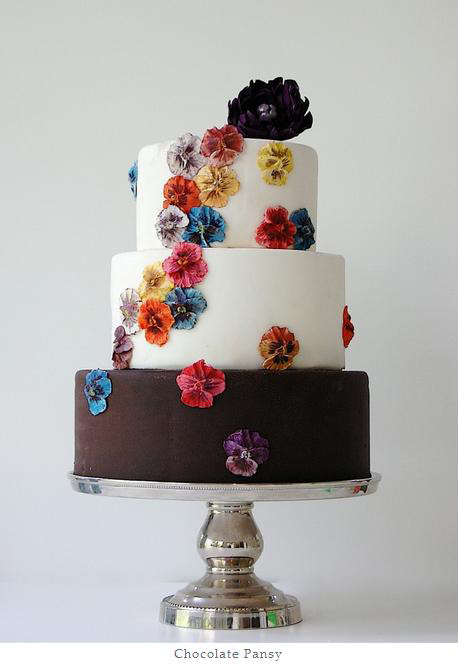 Now let's waltz on over to the ever talented Tosh's blog! Stamps: Waltzingmouse - Ovals Classic Frames, Big Day Essentials, flourish on envelope from Flourishes Scallops Dots.